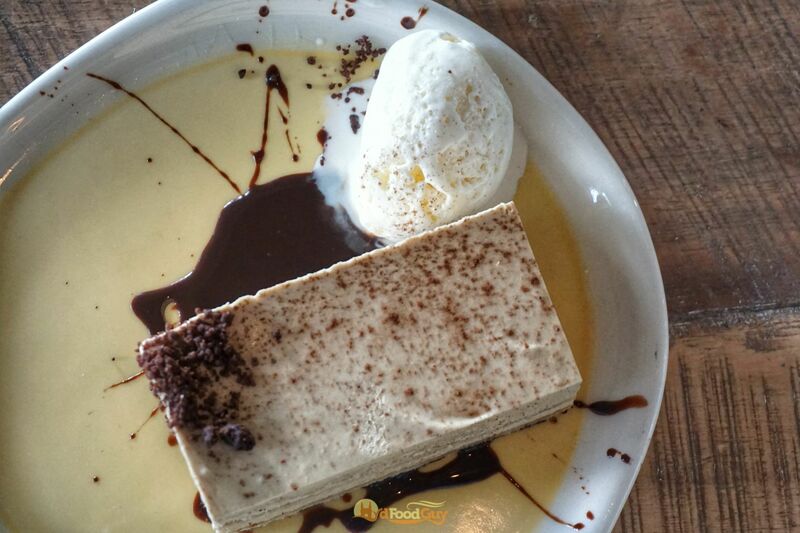 Olive Bistro’s arrival in Hyderabad was met with an unprecedented amount of fanfare. From film stars and page 3 socialites to the average foodie like me, everyone flocked to get a taste of Olive. The charming Mediterranean themed decor and the sprawling outdoor seating options in the vicinity of the secret lake (Durgan Cherevu) was perfect foil for the food at Olive that was a mix of the cafe favourites like Sandwiches and Pizzas along with a few gourmet selections like the Twice Cooked Pork Belly and sinful desserts like the Insanity Cake and Tiramisu in a Jar. Olive is known to revamp its menu with a change in the season. But, the Autumn menu refresh is much more than a tweaking of the menu. When Olive began it had Penne Pasta in White Sauce on the menu because that was what the diners wanted. But, how many of us now go to an upscale restaurant and order Penne? 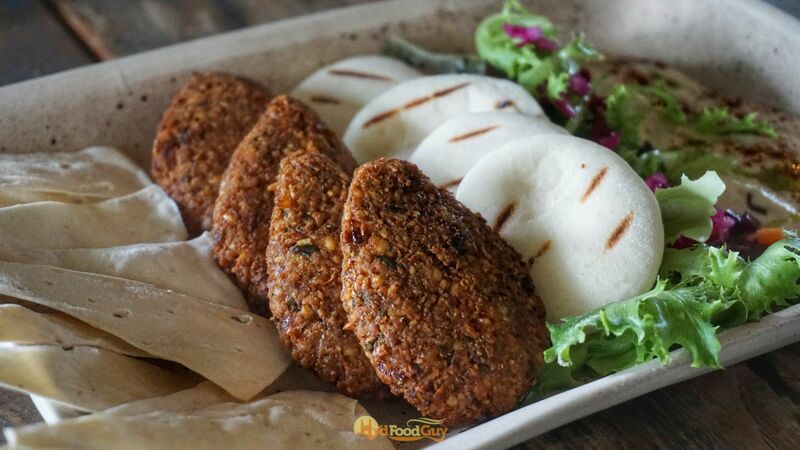 “The food scene in Hyderabad has evolved over the past four years. The new menu is designed to showcase modern techniques and innovative flavours while staying true to the spirit of the classical dishes”, explained Shaaz Mehmood, a partner at Olive Bistro. The Autumn 2017 menu has been crafted by the immensely talented Chef de Cuisine Rishim Sachdeva, who’s heading the Olive kitchens in both Mumbai and Hyderabad. Chef Rishim began his foray into the culinary world at a tender age of six and already has an impressive resume that includes working with Marco Pierre White at ‘The Oak Room’ and with Heston Blumenthal at the ‘Fat Duck’. Earlier this month, I was invited to a tasting session featuring a selection of the new introductions at Olive. Chef Rishim is known for his maniacal obsession with fresh and local produce. 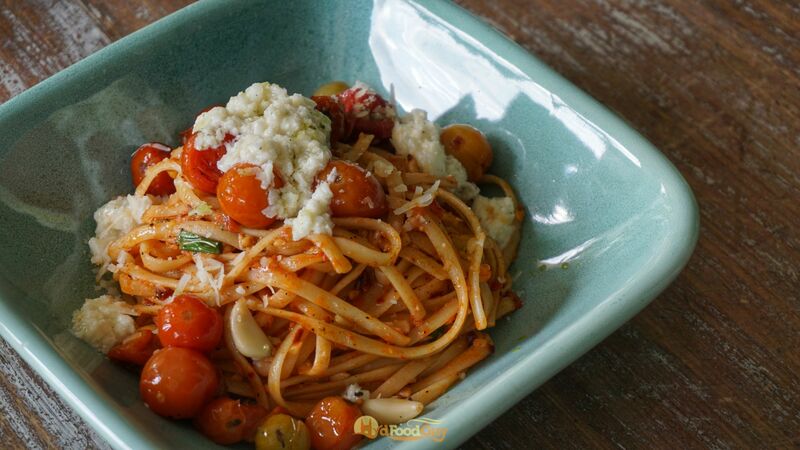 “In this menu, we have used a lot of home-made and fresh ingredients. We have made our own kimchi, homemade spices and used techniques such as braising, confit, sous vide”, he explained. 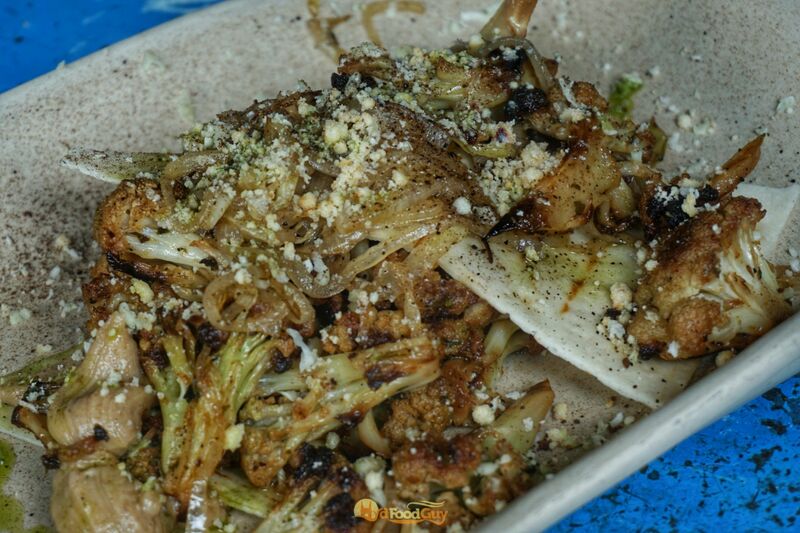 The first dish to arrive was the humble cauliflower that had been marinated in yoghurt and grilled over coal. 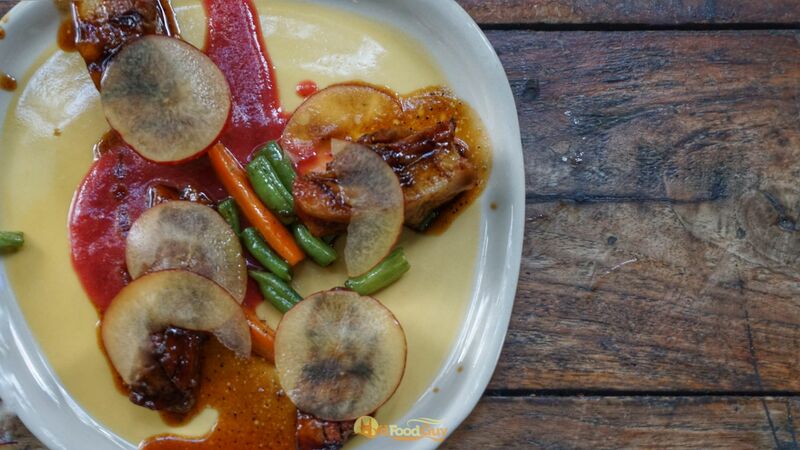 A rustic and unassuming dish that wowed everyone on the table owing to the flawless execution. The second vegetarian appetiser was Hummus and Falafel served with Pita Breads and Lavash. 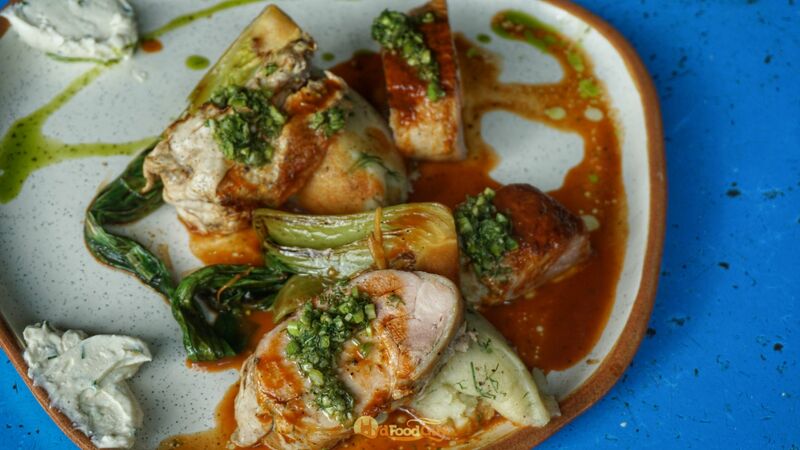 The dish looks deceptively similar to what’s available across the city, but there are minute modifications to satiate the discerning palate. The Hummus was fermented overnight to lend it a subtle kick and the Falafel had a hint of smokiness. The non-vegetarian section boasted of a bunch of eclectic creations. Red Velvet Fried Chicken is a vividly coloured, eye-catching creation whose mention in the menu had raised a few eyebrows. But, one bite and all the doubts were put to rest. This is a twist on the good ol’ buttermilk marinated Southern Fried Chicken. The twist here is that the Chicken is additionally marinated in the unsweetened batter of Red Velvet and then tossed in Red Velvet cupcake crumbs before being plunged into scalding hot oil. The Red Velvet crumbs are crispy but also have a cakey, softness about them. 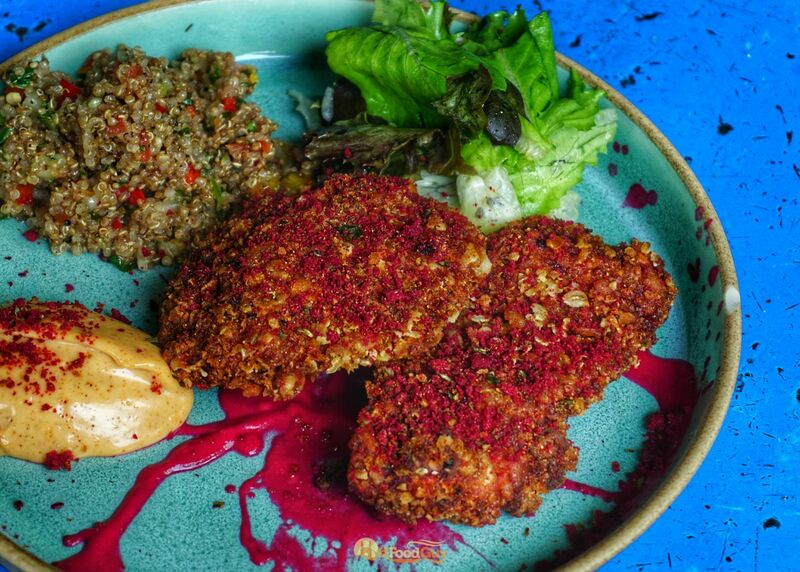 The Chicken is paired with a quinoa tabbouleh and a cheese sauce. The Kefir Lime Fishcakes surprised me with the intensity of the Kaffir Lime. 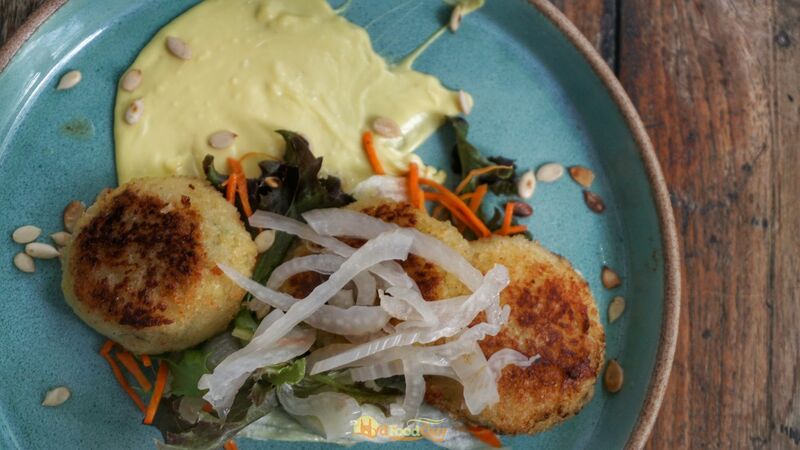 In this dish, the popular Thai ingredient not only lends its aroma but also a lot of its acidity, that’s adeptly balanced with the rich saffron aioli. 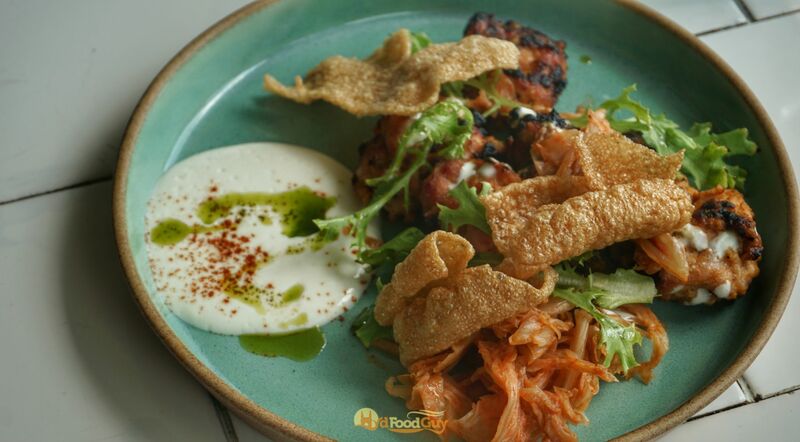 The delicate balance of flavours that Chef Rishim loves was also in display in the Chipotle Chicken skewers, that came with a side of spicy Kimchi (pickled cabbage), feta cheese, and sweet potato puree. And last but not the least, we were served the brilliant Pork and Plum from the Hoppery menu. Sous Vide cooked Pork Belly that’s smoked and served with a plum vinegar sauce — a classic pairing of flavours elevated by modern cooking techniques. It’s difficult to make a Polenta, an Italian staple prepared from boiled cornmeal, appealing. But, the one I was served at Olive is delish – the Polenta is grilled till crisp and then sandwiched between Ratatouille. Chef Rishim fused the English favourite Grilled Chicken with popular flavours from across the pond to create the fabulous Maple and Chipotle Grilled Chicken that’s served with an asparagus chipotle salsa. 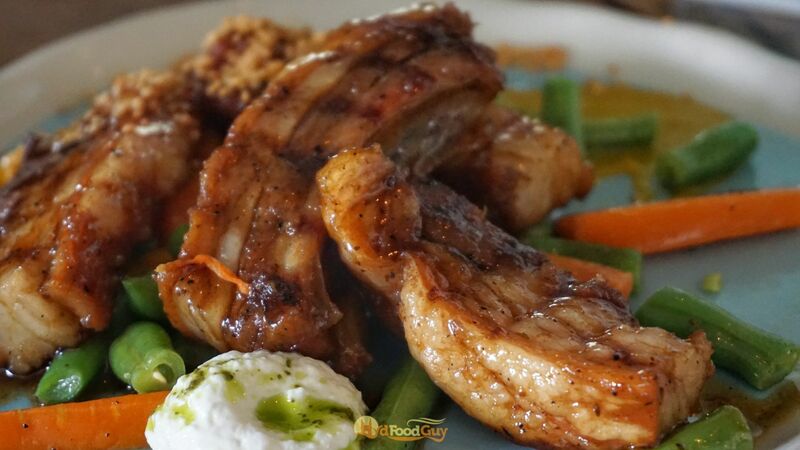 This spunky avatar of the Grilled Chicken is fun but retains its soulfulness. 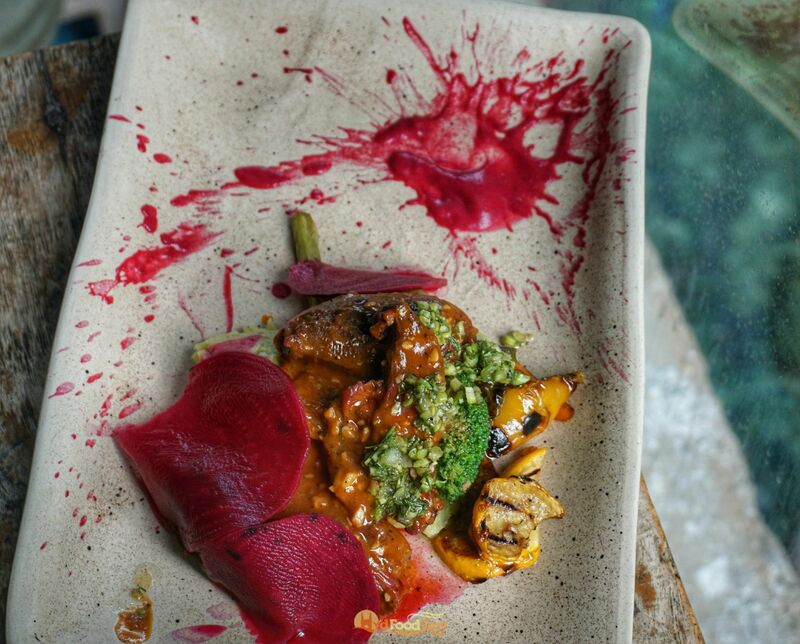 Chef Rishim’s creations are vibrant and playful – almost every dish is an eye-catching array of colours with sauces gleefully splattered on the plate. 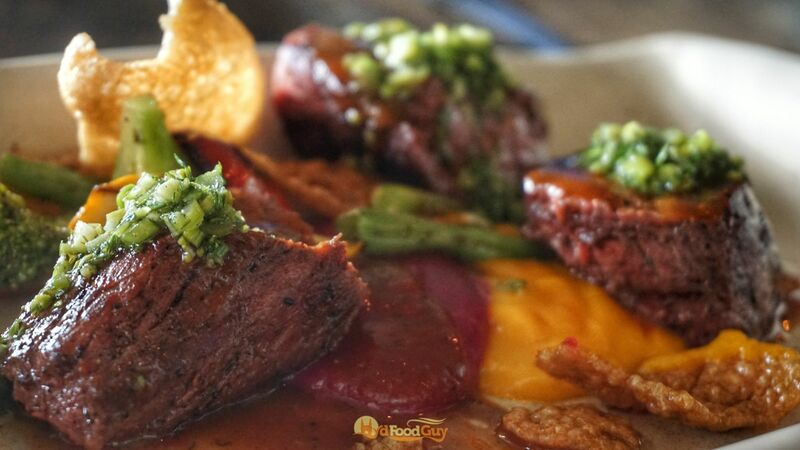 The Grilled Tenderloin arrived in a bed of roasted purple sweet potatoes and mango puree. The meat is sourced from Bangalore and further aged in Hyderabad. The sauce is absolutely delightful, unfortunately, the meat we were served is ‘Medium’ done, which is not quite my cup of tea. Olive has always had some stunning Pork dishes and I was looking forward to the Pork Belly Rice. 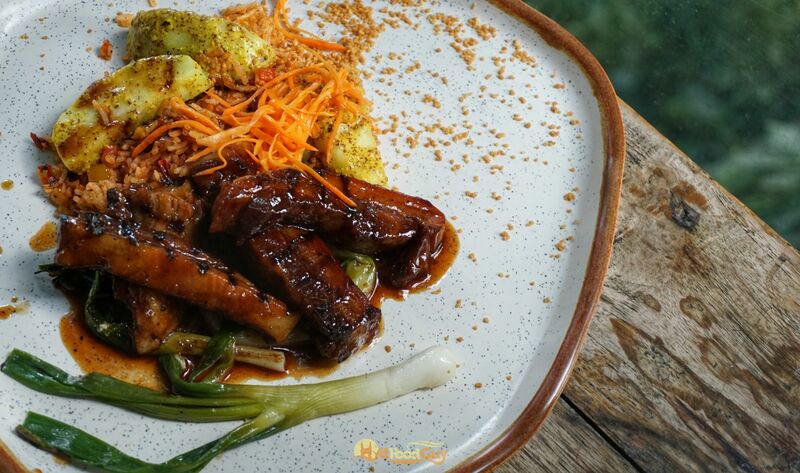 Belgian Pork Belly is slow braised and seared and served with rice and kimchi. This dish lived up to my expectations and then some. However, if there’s only one dish that you could order, it should be the Slow Braised Lamb. 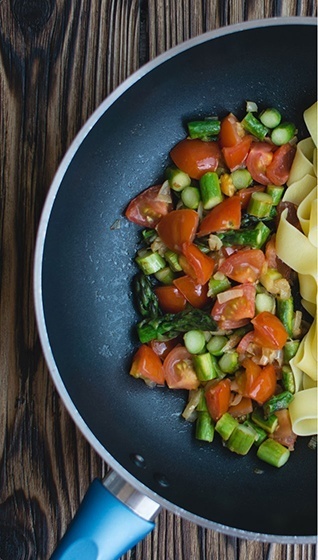 This dish is inspired by the African Lamb Tagine. The Lamb is cooked for 72 hours, which lends it a phenomenal texture. It’s tender and juicy, but it retains the meatiness. It’s served with beetroot mash, pea and potato puree, and some crunchy greens. The desserts section retains some of the old favourites like the Insanity Cake, but also has a host of new additions. 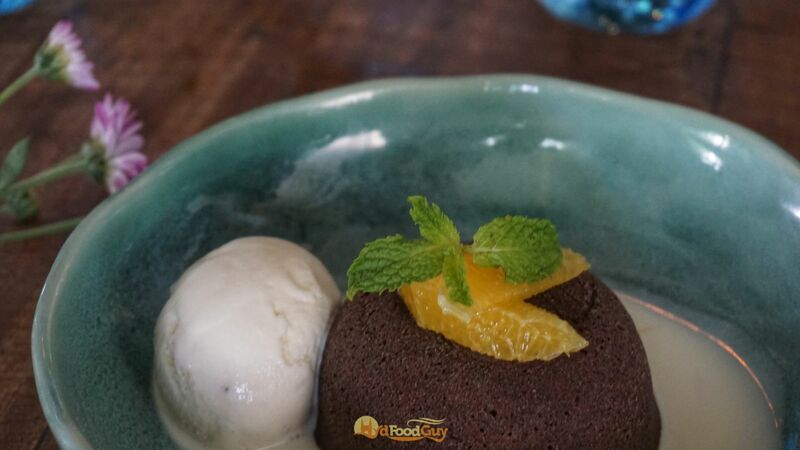 The Chocolate Fondant, which is more popularly referred to in the city as Choco Lava Cake or the Chocolate Bomb, was just perfect. And, the wonderful citrussy white chocolate cream makes you want to keep going back for more of that gooey chocolate. 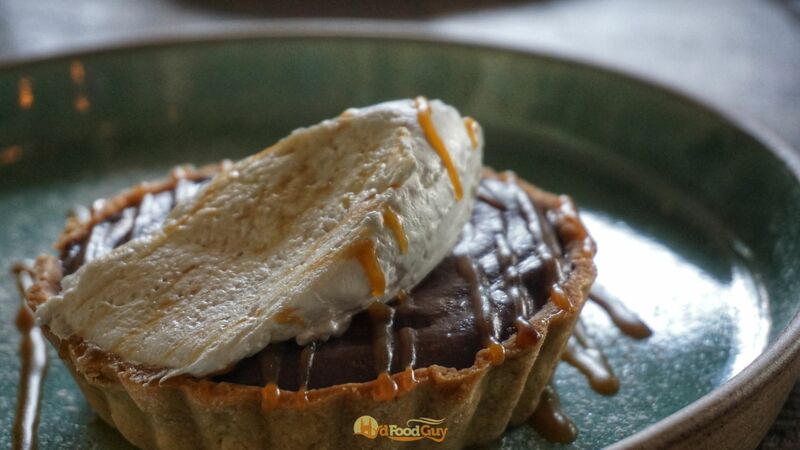 Salted Caramel Tart looked pretty as a painting. Bite-sized with a beautiful pairing of chocolate, salt, and caramel; this was the perfect end to a lavish and memorable meal. While I had met Chef Rishim at a Cheese and Wine pairing event last month, the new menu tasting was my maiden opportunity to witness his culinary skills and savour his creations. As you must have already surmised by now, I’m pleased as punch with the Autumn Menu at Olive. I’ve recently heard tales of middling service at Olive; but, it’s nigh impossible to judge the service at a tasting session. 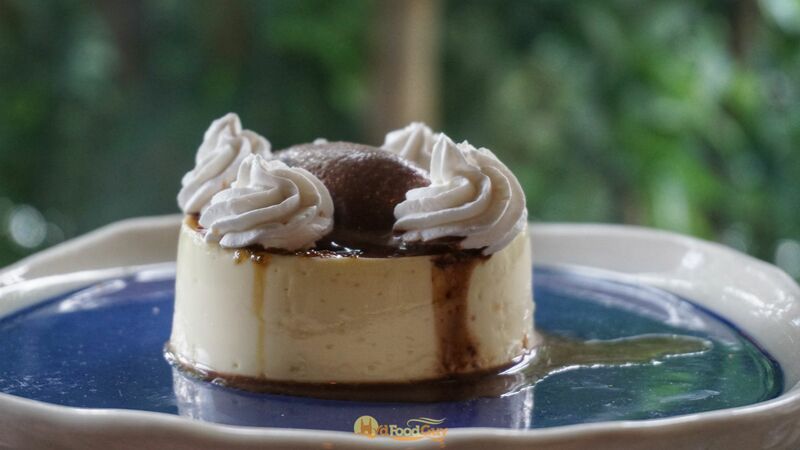 However, the combination of picturesque setting, delightful food, freshly brewed craft beer, and delightful cocktails, puts Olive Bistro in a league of its own. A meal for two will cost around Rs. 3000 (without taxes).